Welcome to the IDDBA Community, our new online platform. We've created this space for members to network and communicate with one another, discuss the latest trends and important and timely issues in our industry and easily access professional resources and information on upcoming events. Whether you are new to the IDDBA or you have been a member for many years, we've put together the following tips to help everyone get the most out of their experience using the site. We are so glad to have you! 1. Sign in. If you haven’t already done so, sign in by using the upper right-hand navigation button. Having trouble signing in? Please contact communityadmin@iddba.org. 2. Navigate to your community profile. Click the drop down arrow to the right of your profile image or avatar. Click the "PROFILE" button. 3. Tell us about yourself. If you have not already done so, take a moment to fill out your profile. The more information you share about yourself, the easier it will be for like-minded peers to connect with you. Please take a moment to add your profile image and bio. 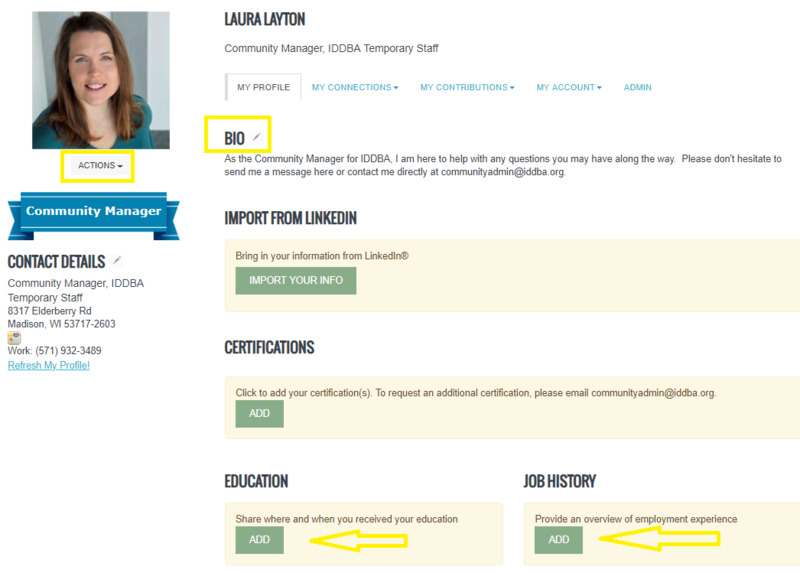 If desired, you can also add information to the Education and Job History sections of your profile. 4. Review your Privacy Settings. Under the MY ACCOUNT tab on your profile, click on PRIVACY SETTINGS. Here you can indicate who can see the information you share on your profile. By default, your company name is set to "Public" and your photo, address, community contacts and job title are set to "Members Only" (IDDBA Members). 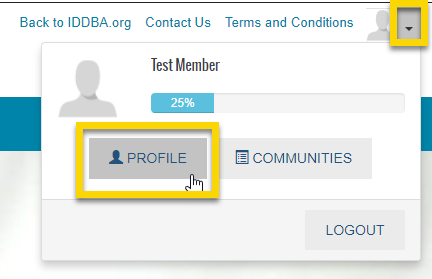 Note: You can also choose to exclude yourself from the IDDBA Member Directory (only accessible to IDDBA members) should you wish to do so. Should you choose to update any of these settings, scroll to the bottom of the page and click to Save. 5. Review your Community Notifications. Under the MY ACCOUNT tab on your profile, click on COMMUNITY NOTIFICATIONS. Here you can indicate how you receive community emails. By default, IDDBA Members will receive a Daily Digest email from the Open Forum. 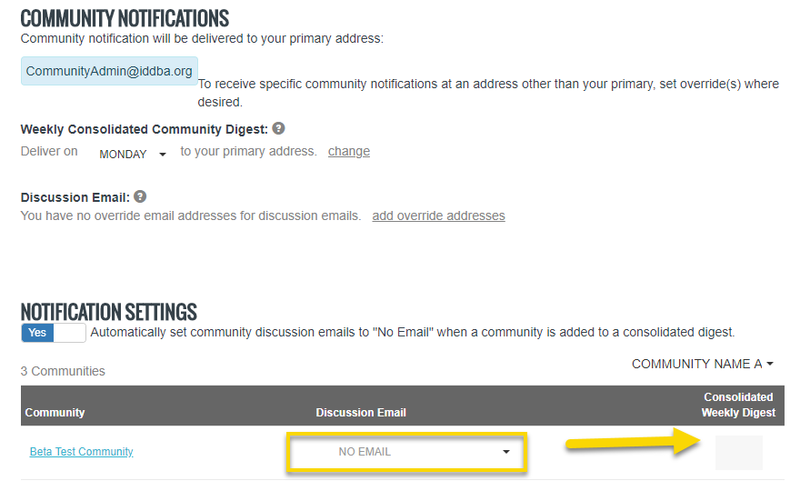 Should you wish to only receive one consolidated email with the previous week's activity, set your Open Forum email subscription to "No Email" and check the box in the "Weekly Consolidated Digest" column. You can indicate what day of the week you would like to receive this email and if you'd like to receive it to a different email address (different than the email address you use to log in). Should you wish to receive community emails to a different email address, simply click to add an "Override Email Address" for the desired community. *For additional tips and how-to's, please see our Help/FAQs page.